Crocodile Games - Press: The Hydra, now available! We are happy to announce that the Hydra is now in-stock and available for purchase! The Hydra miniature was sculpted by Chris FitzPatrick, and measures roughly 5.5 inches long (or about 140mm). It is a multi-part resin kit, and contains 5 heads, 1 body, 2 legs, 1 tail, 1 resin scenic base, and 1 laser-cut wood gaming base. It was molded and cast by the experts at On the Lamb Games, and they did a great job capturing the serpentine detail of the original sculpt. The miniature is supplied unpainted, and require some assembly. You can get yours now, in the Croc Online Store. We also have a downloadable PDF of the Hydra rules for WarGods of Olympus, available HERE. 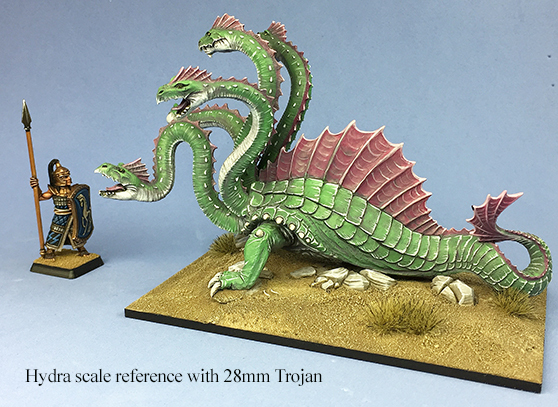 The above photo shows the size of the Hydra next to a 28mm miniature. 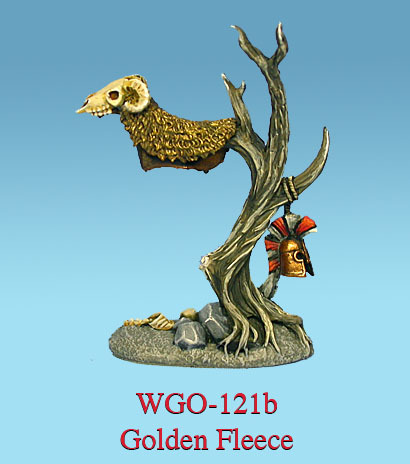 Oh yeah, do you need a Golden Fleece for your Hydra to guard? We have one of those too! The Golden Fleece is also available HERE.